Another dish where necessity was the Mother of Invention! An unexpected visitor, Thursday evening, not much to raid in the larder, so grabbed some spinach from the garden, fried up some streaky rashers lots of garlic, threw in some chopped mushrooms, a slug of cream & then popped the spinach on top where it wilted & melted into the mix-not forgetting that black pepper! 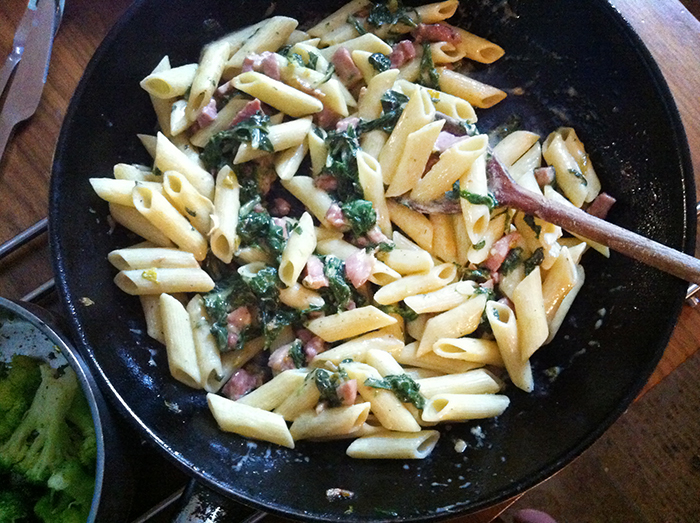 penne pasta bubbling away in a pot alongside-very tasty supper, now a firm favourite.